You could be forgiven for thinking that all gardening gloves were created equal – especially if your only experience with them is hand-me-downs from family members who’ve treated themselves to a shiny new pair, or the ones you’ve quickly grabbed from near the till at the garden centre when you realise you have a rose bush to prune when you get home. But in reality, that’s far from the truth. First, there’s the overall type to choose. In terms of specialist kit, the vaguely medieval-sounding rose gauntlets are the best gardening gloves of thorns, designed to minimise scratches and protect the forearms when reaching into prickly rose bushes, but their full-coverage design can also be useful for gardeners with allergies. Meanwhile, grippy and durable work gloves are useful for a variety of garden jobs including digging and hauling garden waste, and often come with reinforced or padded bits. In terms of material, leather or faux leather gardening gloves are the standard cover-all buy, offering a happy union of protection and flexibility, while cotton and nylon gloves are good for light occasional use and delicate jobs. Next, if you're a female gardener, it is important to know if your pair are suitable gardening gloves for women. You need a size that is appropriate for smaller hands, or you'll be losing dexterity. After that, the individual subtleties are all down to you. 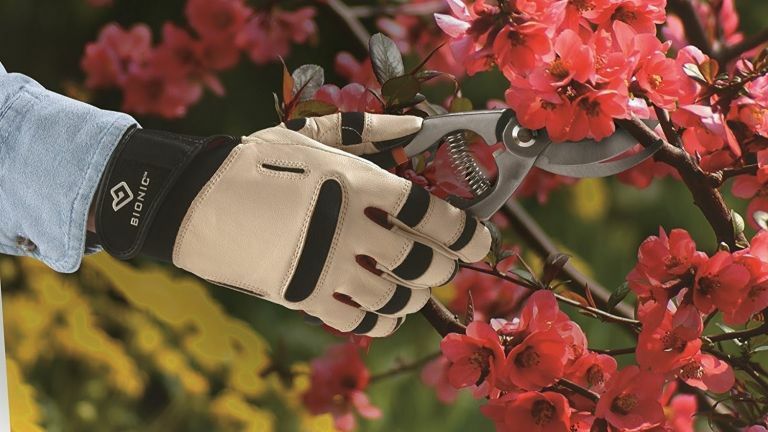 Whether you spend your days in the garden doing delicate deadheading or wielding power tools like chainsaws and strimmers (maniacal laughter optional), there’s a glove for your needs, so keep reading to find out which of our picks is right for you. Then, check out plenty more buying guides and garden advice. These inexpensive gardening gloves are just right for a little light weeding and digging here and there, and their budget price shows you don’t have to pay over the odds for a decent pair. Their knitted nylon construction is lightweight and flexible for delicate, detailed tasks like sowing small seeds and pricking out, and the nitrile-coated palm gives them some back-up. The elastic wrist closure doesn’t offer close-fitting protection, but if you’re not going near prickly plants or doing heavy-duty work, it’s perfectly good. These gents’ gardening gloves have the rare distinction of being the only ones recommended by the RHS, and we can see why. They’re supremely comfortable and robust, made from high-quality supple deerskin leather, with a close fit and flexible back for increased dexterity around tricky tasks. They also provide all-over protection from pricks and scratches, so they’re a decent substitute for a rose gauntlet if you’d rather invest in a more multipurpose gardening glove. These lovely-looking gloves won’t just cheer you up during a grey day’s gardening, they’ll also keep you connected with their touchscreen-compatible fingertips and thumbs. If you’re mid-rant to your best friend or in the world’s most active WhatsApp group, you don’t have to keep taking them on and off to use your smartphone or tablet while out in the garden. And, with their stretchable back and machine-washable fabric, they’re both comfortable and convenient. As the best gifts for gardeners go, these are pretty high on our list. With their superior protection and pocket-friendly price, these gauntlets offer exceptional value and are the best gardening gloves for thorns. While much less dear than other full-coverage designs, they still offer a great deal of dexterity, boast reinforced knuckle and fingertip protection to foil any especially determined thorns, and offer an extra defence to sensitive forearm skin for allergy sufferers. The only weak spot is their palm protection, so it’s probably best to exercise caution when gripping especially thorny stems. These slimline and stylish gardening gloves are deceptively good-looking — they’d even pass muster as a last-minute grab to wear on a cold-weather walk — but they have all the functionality you’d expect. The soft-feel fabric is hard-wearing, the stretchy mesh between the fingers keeps you dextrous and cool, the padded palm offers extra cushioning when using tools, and the wrist strap means they stay put and guards against debris. The elegant design makes them a great gift for father’s day, while the comfortable and durable construction ensures he’ll use them year-round. Need women's gardening gloves? Shop ladies' gardening gloves at Amazon. For wearing over long periods of time while using power tools, these light and comfortable, yet surprisingly heavy duty gloves, are your best bet. The hard-wearing palm area on the right glove gives you great grip when holding tight to chainsaws, strimmers, and all sorts of other gardening tools, while the heavy padding in the left offers protection, a clever solution to the compromised dexterity of overall padding.